Our nomination of the Anderson Krygier and TSItouch project at the Stanford Biology Building (Morphogenesis) took home gold the gold in Educational Environments at this year's APEX Awards! Check it out! Check out all of the winners! 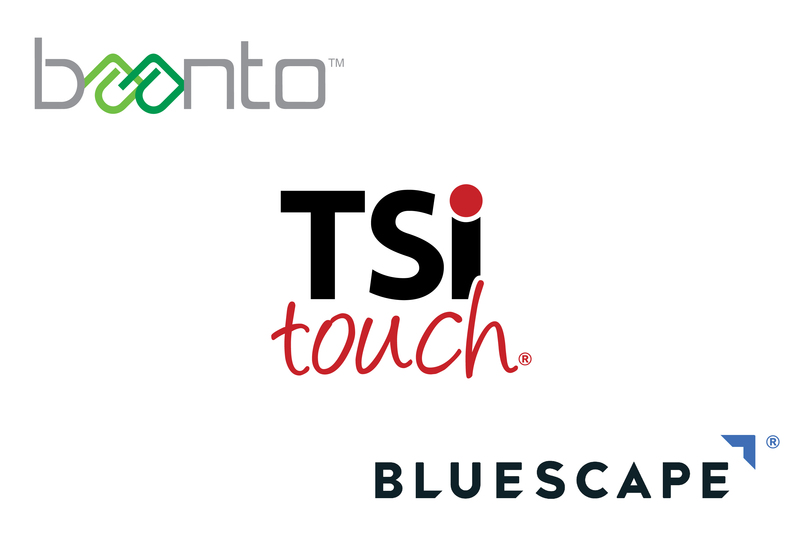 Congratulations to BSC Enclosures for becoming a TSItouch Certified company! 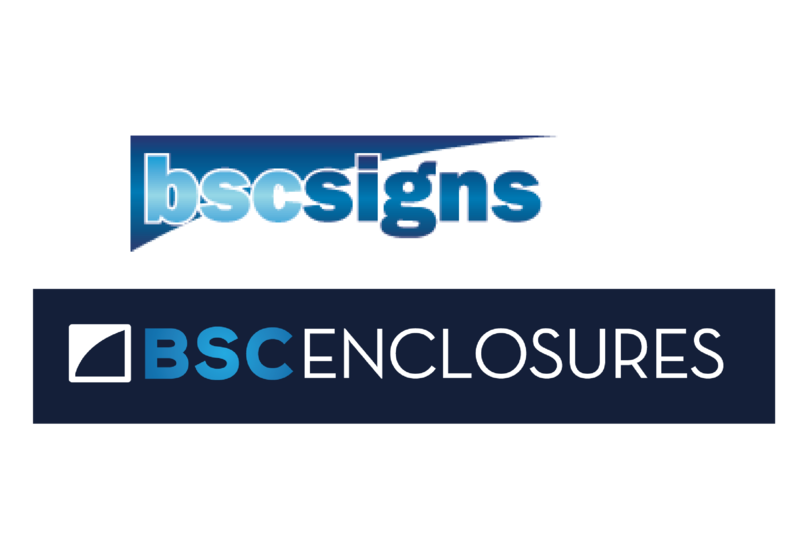 TSItouch looks forward to continuing our long-running relationship with BSC. Between TSItouch and BSC, the complete package of hardware for interactivity can be provided to your customer. The TSItouch team is overjoyed to work with a company with great customer care and values like BSC. 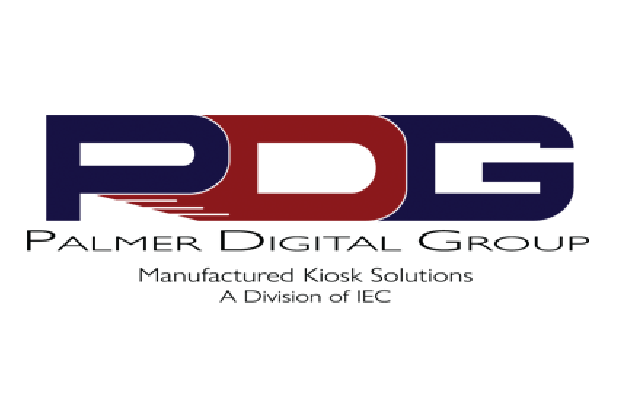 Congratulations to Palmer Digital Group (PDG) for becoming a TSItouch Certified company! We look forward to our continuing and strengthening relationship with PDG! Their digital kiosks have proven to be a high-quality product. The solutions created between TSItouch and PDG have amounted in a seamless process with great end-user satisfaction. We are recognizing the best of the best! 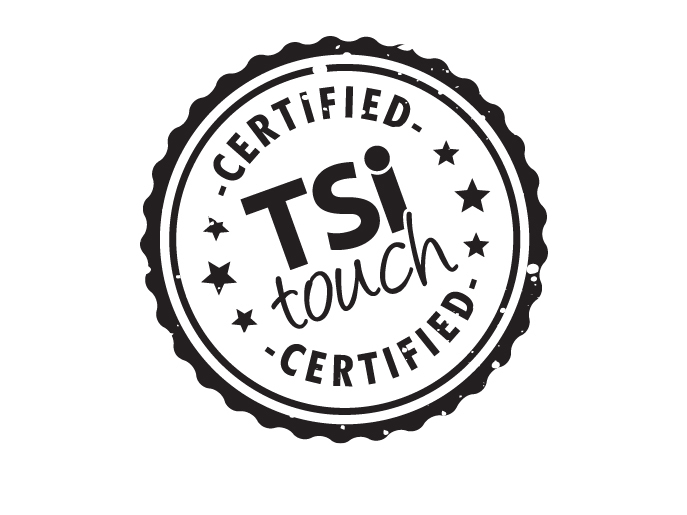 Partnerships are the heart of our business, which is why we are acknowledging our most trusted partners as TSItouch Certified. Find out how your company can become certified! Layer Logic Inc., a company dedicated to making collaboration seamless and spontaneous, and TSItouch are partering up! Check out our press release to learn the about the partnership. 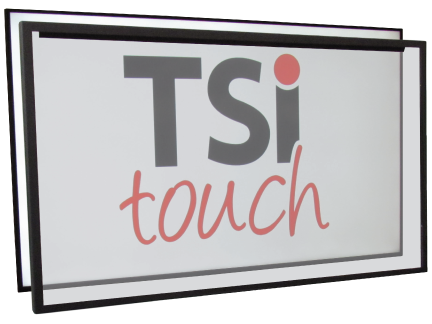 TSItouch offers a protective solution for nearly any commercial grade display in the industry, not only for video wall displays. Our full steel chassis combined with extremely strong tempered glass provides additional protection to all types of commercial grade displays. The TSItouch Glass Retention Bezel System (GRBS)* for video wall displays provides an alternative solution to bonding cover glass. The GRBS is a cost effective, serviceable, and modular solution that allows protective glass (clear, anti-reflective, and anti-glare) to be mounted directly to each display, providing protection to the OEM bezel and displays’ panel. Typical video walls are made up of displays with ultra-narrow bezels which range anywhere from 1 to 5 mm in thickness. Ultra-narrow bezels provide users with an enhanced viewing experience and are aesthetically pleasing, but they leave the displays vulnerable to damage. Displays with ultra-narrow bezels are not designed to withstand interactions with the general public. 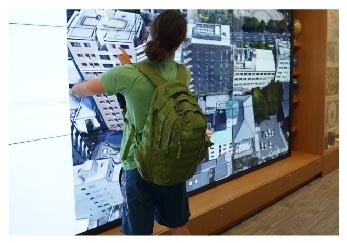 In the event that a video wall is mounted in an area where it can be accessed by the general public, there is a high probability that the displays will be damaged, requiring repair or replacement. The traditional method for protecting large video wall installations is to bond a piece of cover glass directly to each individual display. There are several drawbacks associated with bonding cover glass to displays: lead time, serviceability, cost, and warranty support of the display. In the event that a display requires repair or replacement, the bonded cover glass must be debonded before it is returned to the OEM. This causes several issues: end users incur significant freight costs, the process is time consuming, and displays are frequently damaged during the debonding process. Once the unit is repaired or replaced, the lead time and expense to have glass re-bonded will be re-incurred. The TSItouch Glass Retention Bezel System (GRBS)* provides an alternative solution to bonding cover glass. The GRBS is a cost effective, serviceable, and modular solution that allows protective glass (clear, anti-reflective, and anti-glare) to be mounted directly to each display, providing protection to the OEM bezel and displays’ panel. In the event of a monitor failure, the GRBS can be removed, avoiding any issues associated with servicing a bonded display. The GRBS consists of four precision machined metal bezels, 1/8” tempered cover glass, and all mounting screws (per display). Each kit is custom designed to be a perfect fit for each make and model of display. The GRBS does NOT block any of the viewable display and does NOT interfere with any interactive technology. With shorter lead times, lower costs, and simplified life-cycle support, TSItouch’s GRBS provides the perfect solution for protecting your video wall investment. 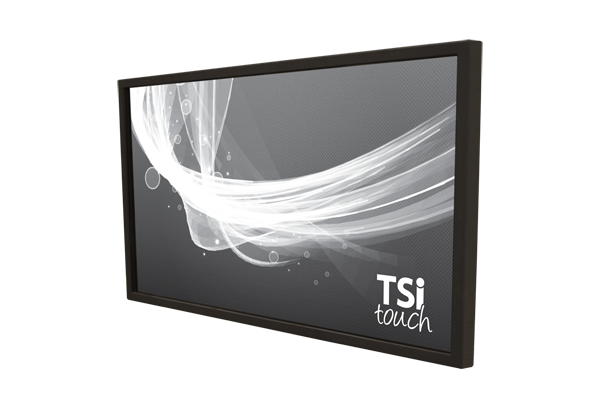 TSItouch offers a protective solution for nearly any commercial grade display in the industry, not only for video wall displays. Our cold rolled steel chassis combined with extremely strong tempered glass provides additional protection to all types of commercial grade displays. The tempered glass featured in our water and dust resistant protective designs breaks down into pebbles rather than shards in the event of a glass failure, leaving a minimal safety hazard.